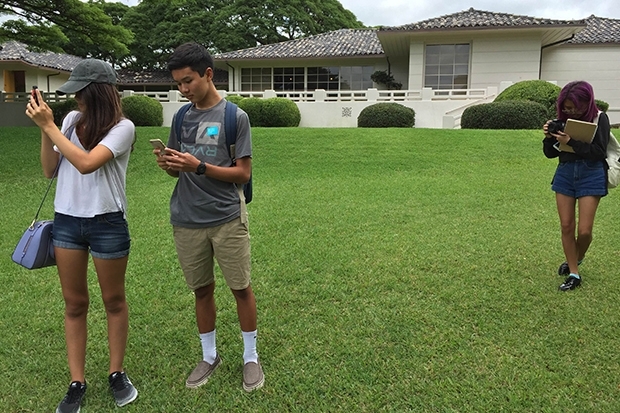 Two weeks ago, about-to-be juniors from Moanalua High School Kylan Tomita, Chloe Popa and Aimee McDevitt were scouting the Honolulu Museum of Art Spalding House grounds for a summer assignment. For their AP Language Arts class, they were tasked to go to a museum, study how exhibitions are structured, then curate their own exhibition that tells the story of a specific person. All three students are in Moanalua’s MeneMAC four-year program that focuses on journalistic and dramatic video production. Were they enjoying their assignment? “It’s more fun than sitting at a desk and writing,” said Kylan. “And it’s stuff that we’re all interested in—art, film, music,” added Aimee. We’re just honored that they picked HoMA Spalding House for inspiration. Besides doing research, these talented teens made a video while they were at the museum. A portrait of a perfect museum summer day! Have a look.